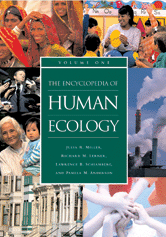 Editors: Miller, Julia R., Lerner, Richard M. and Schiamberg, Lawrence, B. Title gathers knowledge from disciplines that study individuals and groups is blended with information about the environment from the fields of family science, geography, anthropology, urban planning, and environmental science. Includes biographical sketches.